How much is the Prairie Pothole Region worth? A few years ago, a friend proposed a trip to Wollaston Lake near the border between Saskatchewan and the Northwest Territories. The nominal reason for the expedition was to exercise a few northern pike and grayling with fly rods, but the real purpose was to get into a big piece of country we'd never seen before. We caught a jet in the Twin Cities, landed in Winnipeg to clear customs, and then took off again, headed north and west at about 400 miles an hour. At that rate, it still took nearly two hours to get to the lake. After the first 10 minutes of the flight, the northern edge of the prairie below gave way to black spruce and jack pine, a wilderness of boreal forest that stretched out of sight ahead of the plane and faded slowly behind. By the time we landed, I had gained a new appreciation for two realities of geography I should have learned in high school: Canada is a big place, and it doesn't have many people. Canada is the fourth-largest nation in the world, covering about 3.5 million square miles. And there aren't many people -- around 33.5 million, according to the 2009 estimates. Canada's population density of 9.5 citizens per square mile makes it the ninth-most sparsely populated nation in the world. These bald statistics, by themselves, don't offer a very accurate description of Canadian population. More than 60 percent of Canadians live in Ontario and Quebec, and almost 90 percent live within 100 miles of the border with the United States, concentrating the impact of agriculture and industry in some of the country's most productive natural landscapes. Canada's demographic realities have a huge impact on waterfowl conservation. For almost a century, we've known that most of the best waterfowl breeding habitat lies north of the border. Acre for acre, the prairie potholes are the most productive nesting habitat on the continent, and 60 percent of the potholes are in prairie Canada. The prairie parklands, a mosaic of aspen, birch and grass north of the true prairie, also produce an important share of the ducks that fly south in the fall. Canada is the continent's most important waterfowl nursery. It is a significant responsibility, one Canadians have always taken seriously. The first Canadian migratory bird sanctuary was established in 1887 on Last Mountain Lake in Saskatchewan. Since then, the Canadian government has set aside 51 national wildlife areas and 92 migratory bird sanctuaries -- 28 million acres of habitat for waterfowl and other migrants. In 1935, the darkest days of the Dust Bowl, the Canadian Parliament adopted the Prairie Farm Rehabilitation Act to help landowners in southern Canada re-establish grass on overgrazed pastureland and blown-out fields. Using PFRA, federal administrators have established 2.3 million acres of community pasture, mostly in southern Saskatchewan and Alberta. But once again, the bald statistics are a little misleading. Most of the acreage in federal sanctuaries lies in the subarctic, not in the southern prairies, where intensive farming continues to overrun the shallow wetlands and surrounding native grass so crucial to duck production. And even with the pastures established under PFRA, 75 percent of the native grasslands in prairie Canada has been lost, leaving nesting ducks to crowd into strips of cover where they are far more vulnerable to predators. The net effect has been a shift in duck production. 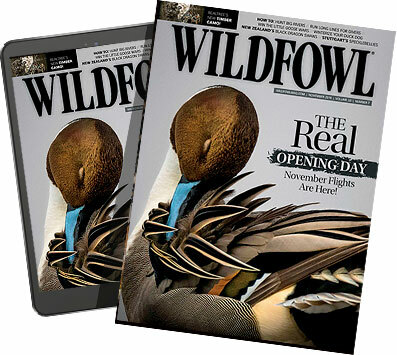 When it comes to putting ducks in the air, the strip of habitat through central North Dakota and northeastern South Dakota is the best of the pothole country today, outstripping production in the traditional strongholds of southern Canada. Without the well-funded government support for habitat that has been in place on the U.S. side since World War II, Canadian duck habitat has simply deteriorated faster. And without the efforts of private conservation groups headquartered in the United States, waterfowl habitat in prairie Canada would be in even worse shape. Those of us who reside in the United States wonder why Canada hasn't established a CRP-style land retirement program that would help farmers and wildlife at the same time. A lot of Canadians wonder the same thing. The obvious stumbling block is the price tag in a nation the size of the United States with only 33 million people. Still, a growing number of conservationists in Canada think it's time their federal government becomes more involved in conservation on the farm. The U.S. Conservation Reserve Program has been a boon for nearly all Americans, in the country and in town. CRP has been a boon for wildlife, including ducks, but the primary purpose of CRP isn't to provide habitat -- it is erosion control. The scoring system our federal officials use to rank potential CRP contracts leans toward land that is unusually susceptible to soil erosion. Planting permanent cover on such fields holds soil in place, which is a huge benefit in itself. It also slows run-off, reducing the frequency and severity of floods, filters run-off so that water quality in streams and wetlands improves, and encourages water to sink into the ground, recharging aquifers and raising the water table. During severe droughts, permanent cover reduces wind erosion and improves air quality. We know ground cover helps ducks, and research over the past 30 years has proved it improves habitat for a host of non-game prairie dwellers as well. As a group, North American prairie birds have shown disturbing downward population trends over the past 60 years, but CRP has helped stabilize their numbers. And in the past decade, we've found out that preserving or restoring prairie sod is a highly efficient way to trap some of the carbon we release when we burn fossil fuels. In 1997, a group of economists and ecologists headed by Robert Costanza at the University of Maryland made an effort to estimate the value of ecological services worldwide. They calculated that an acre of grassland provided about $94 of services a year. An acre of forest provided $392 of services a year, while an acre of wetland provided nearly $6,000 of services a year. In another study, funded by Ducks Unlimited Canada and The Nature Conservancy of Canada, Nancy Olewiler with the Department of Economics at Simon Frasier University in British Columbia summarized her findings: "These resources are assets that yield goods and services over time -- goods and services that are essential to the sustained health of our environment and the economy." e on that landscape are likely to prosper. When they struggle, it's a sign that people will soon be struggling as well. Canadians face the same question that continues to challenge us in the United States: How much are we willing to invest in the land that sustains us? Chris Madson is an avid waterfowl hunter from Cheyenne, Wyo.